At Bartlett, one of our core values is leadership in the tree care industry. Participating in tree climbing competitions helps us demonstrate this leadership status while also translating into real-world skills that yield success for our company. Recently, I competed in one such event, the MAC-ISA Tree Climbing Championships. Having tree climbers attend and compete in a tree climbing competition offers a great boost in morale. It’s a day to get hyped and excited as if you were watching the Superbowl, Kentucky Derby, Champions League Final, or Boston Marathon. Watching some of the best tree climbers in the area compete can inspire us to achieve a high level of climbing skills. Many tennis fans are inspired by Roger Federer winning a grand slam title; likewise, many tree climbers can be inspired by the competitors in the tree climbing competition. All tree climbers, but especially the young and new, who are getting started in this challenging profession look for an idol that has fun, good tree climbing skills, and a great, upbeat, and energetic attitude. Work Climb – simulates a typical pruning operation in which the climber must visit four workstations in the tree and successfully complete a task at each station. Belayed Speed Climb – the climber ascends the tree using the limbs, the belay rope, and/or fixed ropes in the tree. Footlock – is a technique used to ascend a rope hung freely in a tree so that no part of the rope (except the anchor point) or the climber touches the tree during the climb. Throwline – is a timed event that tests the climber’s ability to accurately place a throwline and climbing line in a tree at various heights. Aerial Rescue – is a timed event that tests the climber’s ability to assist emergency medical technicians by climbing to and safely lowering an injured climber. All of these events can be performed almost every day of the week, except for the aerial rescue which is a good situation to practice regardless. The tree climbing competition events remind me of the NFL Scouting Combine where players compete in different events that test their athletic ability. Typically, doing well in the combine translates into success on the field and the same goes for tree climbers. However, it’s important to realize that some players or climbers may have strengths and abilities not measured in competition events that can translate into success on the field or in the tree. 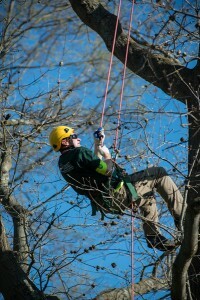 Bartlett’s Virginia offices are heavily involved with the Mid-Atlantic Chapter of the International Society of Arboriculture Tree Climbing Championship. At this year’s event we had six Bartlett climbers in a field of 33 total competitors. Two Bartlett competitors made it to the Masters’ Challenge, which is a final event of the top four scores in the competition. Bartlett sponsored the work climb event in the competition and we had seven employees who were part of the judging staff, event committee, and clean-up day. Such support for the tree climbing event starts with our Division Manager, Alan Jones, who is also an ISA Certified Tree Worker; this certification can be obtained from competing in the tree climbing competition. 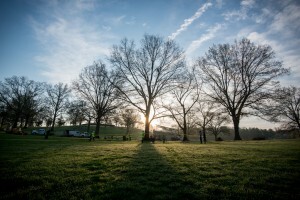 All of this demonstrates our belief that tree climbing competitions play an important role in the future success of the tree care profession. Photos courtesy of Bartlett Arborist Patrick Teague.